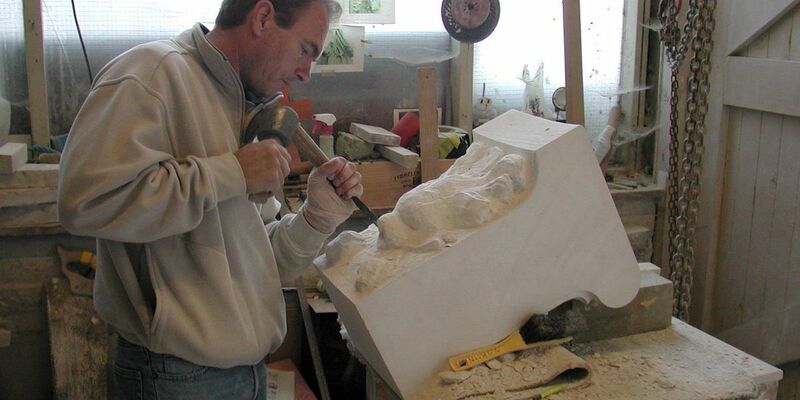 The people who work to conserve the Cathedral’s fabric are highly skilled artists and craftspeople. Their work requires sensitivity to the spirit of the building. The aim is to slow down the process of decay, and to replace only those parts that have lost the battle for survival. measuring old stones that have to be replaced in order to recreate their shape using geometry to produce templates. cutting large blocks from the quarry into smaller pieces to be carved, but making sure that this is done correctly so that the stone is fitted into the building in its “correct bed” and each block is used economically. shaping the stone using the templates to precise dimensions in order to fit a specific place in the building and perform a particular function. putting the finished stone into the building using the correct lime-based mortars. cleaning and consolidation of historic, often original medieval stone, using tried and tested techniques. Our apprentices learn about modern, mechanised methods of masonry, but they all start their training by working stone in a traditional manner, using hand tools. This gives them a far greater understanding of their craft and an appreciation of the effort and skill used by medieval Cathedral builders. Canterbury is one of eight English cathedrals that have joined forces to form the Cathedral Workshops’ Fellowship. This aims to promote quality and depth in craft training and thereby establish those cathedrals as Centres of Excellence. Our apprentices now train for a minimum of 4 years. During this time they will concentrate on acquiring their craft skill but this will be underpinned by knowledge that they also need to become rounded craftspeople. Subjects covered in their academic training include: Architectural and Art History, Archaeology, Conservation (Philosophy and Practice), Basic and Advanced Geometry, Architectural and Decorative Carving, Stone Fixing, Geology, Structural Engineering and Project Management. It is hoped that at the end of this initial period of training, those who wish to do so will have the opportunity to progress via the Higher Education route to achieve further academic qualifications.